Note: 7 nights in hotels, 7 nights cruise on Eurodam and 1 night in flight. Rocky Mountaineer’s SilverLeaf Service from Banff to Seattle. tour of Banff & Lake Louise. take in awe-inspiring views as you travel along the Icefields Parkway. 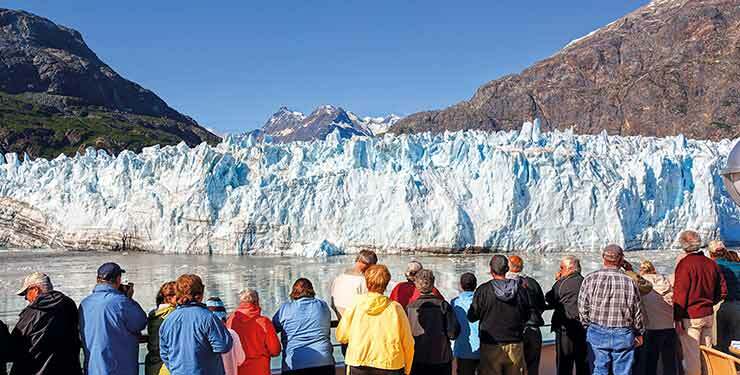 watch for icebergs and calving glaciers in Glacier Bay National Park. Sky-scraping mountains, tumbling turquoise waterfalls, vast alpine meadows and enormous glaciers - the beauty of the Canadian Rockies and Alaskan coast is both wild and extravagant. As well as taking in the exhilarating scenery along the Rocky Mountaineer rail route and sailing through the wildlife-filled Alaskan fjords, you’ll have the opportunity to relax in the delightful mountain town of Banff and sightsee in the sophisticated metropolis of Vancouver - one of the world’s most attractive cities. 2) Offers applies to new bookings only and cannot be added to bookings already made. 3) Offer is only applicable for 27 May 2019 departure only. 5) All prices are £s per person based on two people sharing a lower deck cabin with return flights from London Heathrow with Air Canada and is subject to availability. Supplements may apply from other airports. 6) VIP door-to-door travel service - Includes a return chauffeur service from your home to your chosen airport for your onward journey and vice versa on your return journey. 7) For single rooms (all subject to availability and extra charges may apply), please call for further details. 8) Prices include savings as advertised, are subject to availability and may change. Prices will be confirmed at the time of booking. 10) Saga reserves the right to amend or withdraw any offers without prior notice.